The family of a Camp Lejeune Marine shot dead on Western Boulevard 36 years has not forgotten him and do not want anyone else to forget him, either. Motorists found the body of Sergeant William Donald Miller lying in the middle of the road on Western Boulevard halfway between Marine Boulevard and County Club Road on September 16, 1972. He had been shot, according to an incident report of the time. Authorities found Miller's car on the shoulder of the road with the engine running, the lights on, a blinker clicking, and a half-cocked pistol on the seat, according to a Daily News archived report. No arrest was ever made in the case. 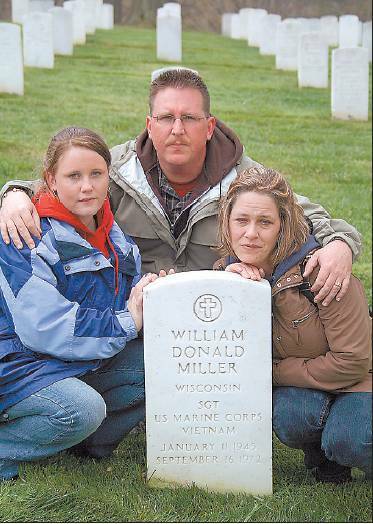 One of Miller's three daughters, Wendy Miller-McGee, who now lives in Colorado, told The Daily News in an e-mail interview last week that she will never forget her father. "My father means the world to me," she said. "I was 1 year old when my father was murdered." Miller-McGee said she last visited her father's grave in Arlington National Cemetery when she was 8 years old. "Ever since then I have always wanted to go back, especially now that I have children of my own," she said. "When my husband Dave told me we were going to Washington, D.C., on a trip I was so excited and could not wait." Miller-McGee, her husband David and their daughter Ashley took the time while on an April business trip to visit the cemetery. Miller-McGee said she could not stop crying when they found her father's grave among the seemingly endless rows of tombstones. "Growing up, I have always wondered about my father," she said. "I have lost a lot since my father was murdered. It breaks my heart that I never got to know him, and he never got to meet his grandchildren." Miller-McGee said her heart breaks every time she thinks about how she missed out on a relationship with her father. She said she is left with questions that can not be answered. "What kind of father would he have been?" she asked. "Was he funny? What kind of person would I be today if I had the chance to grow up with my father? What kind of grandfather would he be? Would he be proud of me?" Miller's sister, Sharron Aguilar, who now lives in Texas, said her family has been permanently affected by the death of her brother. "Our family, who has experienced the violent death of a loved one, has been forever changed into a ‘new normal,'" she said. "We can never go back to how things were, we have to integrate this tragic loss into our lives and move on without our loved one. We will never get over William's significance and importance in our lives." Aguilar said Miller's death affected his entire family, especially since the case has never been solved. "Since there has never been closure, parts of our hearts are buried at Arlington National Cemetery," she said. "My brother was not able to watch his three daughters grow up into fine young women. He did not walk them down the aisle at their weddings. He is not here now to kiss his four beautiful grandchildren." Miller was the oldest of six children, who were always referred in their neighborhood as the "six little Millers." He grew up in a small Wisconsin town called Weyerhauser, "the biggest small town in the state," according to a town billboard. Miller was always looking for adventure, his sister said. "He loved riding his bike, climbing trees, fishing, animals, playing cowboys and Indians with his brother David and picking on his sisters," she said. When Miller was 10, the family moved to Herreid, South Dakota. Miller became obsessed with horses and worked for free at a small ranch just to be around the animals. He eventually became good enough at riding to break horses for the ranch owner, his sister said. Miller was also in the school band and played trumpet like his father, who his sister said he idolized. As soon as he could, Miller followed in his father's footsteps and joined the Marines. His family said Miller was focused on being the best Marine he could be and planned to make a career out of it. His untimely death put a stop to that. Crime Stoppers of Onslow County is offering a reward of up to $2,500 for information that leads to an arrest in the case. Anyone with information can call the Onslow County Sheriff 's Department at 910-455-3113 or Crime Stoppers at 910-938-3273. Callers do not have to reveal their identity. David, are seen gathered around Miller’s gravestone. Miller-McGee has worked very hard to keep her father's memory alive. The domestic troubles between a Camp Lejeune Marine and his wife came to an abrupt end September 1972 when the Marine was found shot dead on Western Boulevard. Now, 36 years later, investigators say they finally know for sure what happened. Marine Sergeant William Miller has been dead for more than three decades, but his family has never given up on finding his killer. Miller's family's persistence; investigations by federal, state and local law enforcement; and two recent Daily News articles about the unsolved homicide led to Miller's wife at the time and her then-lover being charged in Miller's death, Onslow County Sheriff Ed Brown said. George Hayden, 57, a former police chief in Cape Carteret and Belhaven, and his ex-wife, Vickie Miller Hayden Babbitt, 58, of Bend, Oregon, who was married to Miller at the time, have been charged with murder and conspiracy in Miller's death. In 1972, both Miller and Hayden were in the Marine Corps and they were friends. But when Miller returned to Jacksonville following a tour in Vietnam he found Hayden had moved into his mobile home on Piney View Street. Miller had a hard time getting Hayden to leave and finally asked the Sheriff's Department to toss him out. When Hayden left in August 1972, Babbitt went with him, taking the 1-year-old daughter she and Miller shared, all according to a letter from the U.S. Navy's Office of the Judge Advocate General to Miller's family. A neighbor provided a written statement to investigators at the time that when Miller evicted Hayden from his mobile home, Hayden said, "That's OK, I'll get him. I've got a 16." Detectives indicated in their original report that they took Hayden's words to mean he had an M-16. A month passed. Miller did not have a telephone and often took calls at his neighbor's house. Miller's neighbor told investigators she received a call from Babbitt the night of September 16, 1972, asking to speak to Miller. The neighbor went and got Miller who spoke to his wife on the phone. Miller then went to borrow another neighbor's car to meet his wife in the parking lot of the newly constructed Brynn Marr Shopping Center. Miller showed his .22-caliber pistol to a neighbor and said, "I had better carry this because it might be an ambush," according to witness statements gathered by investigators at the time. A short time later, motorists found Miller's body lying in the middle of Western Boulevard about 10 yards in front of the car he had borrowed, which was parked on the right side of the road facing Marine Boulevard with the engine running, the headlights on and a blinker flashing. Miller was shot in the right temple and in the back. A bullet severed his spinal cord, according to autopsy reports. Deputies found two spent M-16 shell casings at the scene, according to original incident reports. Deputies also found Miller's .22-caliber pistol lying half-cocked on the front seat, according to Daily News archived reports. A local merchant had driven past the crime scene at 10:10 p.m., just before Miller's body was found, and saw four cars, two on each side of the road. The merchant described the car Miller had borrowed to investigators and said, "On the same side of the road was a maroon or red 1968 or 1969 Chevrolet." Hayden owned a 1970 maroon Chevrolet Chevelle at the time. Investigators found two empty M-16 rifle magazines in the Chevelle. The SBI conducted a ballistic comparison of Hayden's military-issued M-16 and the shell casings found at the crime scene, but results were inconclusive. Written statements by both Hayden and Babbitt taken by Sheriff's detectives at the time are riddled with inconsistencies, the most glaring whether they owned a TV set or not. Hayden wrote he watched television the night Miller was killed. Babbitt wrote in her statement that she and Hayden had been out looking for a TV set that day because they didn't own one. Babbitt also wrote she took Hayden's car to meet Miller, leaving her daughter with Hayden at his house on Roosevelt Street. A neighbor of Hayden's told investigators he was outside from 10:30 to 10:45 p.m. and he didn't see any lights on in Hayden's house. Babbitt told different investigators different accounts of how long she waited for Miller at the shopping center before returning to Roosevelt Street. Hayden told investigators that after Babbitt got back he drove around Jacksonville for a little while, according to original detective reports. NCIS agents gave polygraph exams to both Hayden and Babbitt at the time, but the results have never been released. Miller's sister, Sharron Aguilar, and other Miller family members refused to give up. Through the years, the family has assisted NCIS in their cold case investigation. Hayden's arrest was news Aguilar said she had been waiting 36 years to hear. "I can't believe it, we have waited for this day for so long," she told The Daily News on Tuesday after learning the man authorities say killed her brother all those years ago was finally behind bars. A key witness in the 1972 unsolved homicide of a Camp Lejeune Marine did not come forward for 36 years because that person feared for their life, authorities said. Onslow County Sheriff Ed Brown refused to identify the witness, saying the person is still fearful and the "horror on the face of the witness was unlike anything I have seen in my 42 years of law enforcement." 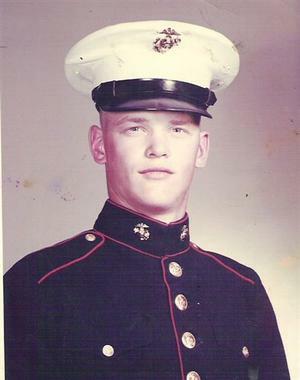 Detectives made two arrests this week in the September 16, 1972, death of Marine Sgt. William Miller, who was found shot to death on Western Boulevard. Former Cape Carteret and Belhaven Police Chief George Hayden, 57, of Portside Lane in Belhaven, and his ex-wife Vickie Miller Hayden Cooper Babbitt, 58, of Ponderosa Loop Bend Drive in Bend, Oregon, were charged with murder and conspiracy to commit murder in Miller's slaying. Hayden was arrested at his home late Monday night in Beaufort County. Babbitt was taken into custody at her home in Oregon. "We have the evidence needed to gain a conviction," Brown said, adding that search warrants were served at both residences and possible physical evidence was seized. Investigators are often unsure of the value of a piece of evidence until it has been sent to a lab for testing. Hayden is being held in the Onslow County Jail without bond. After Babbitt's arrest, she was confined in the Deschutes County Jail. A detective with the Sheriff's Department and a special agent with the Naval Criminal Investigative Service will remain in Oregon until Babbitt is released to them, Brown said. Babbitt waived her right to fight extradition to North Carolina and is expected to be returned to Jacksonville in a matter of days, said Dewey Hudson, the district attorney for the 4th Prosecutorial District, which includes Onslow County. Babbitt's neighbors expressed shock at learning she was accused of murder in North Carolina. "Actually, I'm really surprised, because most of us really know each other," Lori Flanders told KTVZ-TV in Oregon. "So to have someone who had that kind of past or committed that kind of crime among us, we had no idea at all. I guess it really catches me kind of off-guard." Miller, Hayden and Babbitt were all in the Marine Corps in 1972. Miller and Babbitt were married, and the three were friends. In August 1972, Miller retuned to Jacksonville from training in Okinawa in to find Hayden had moved in with Babbitt. Babbitt left Miller to live with Hayden. On September 16 of that year, Miller went to meet Babbitt, but was gunned down in the middle of Western Boulevard. Investigators say Babbitt lured Miller to the spot, possibly by faking car trouble, and then Hayden shot Miller twice with an M-16 - once in the head and once in the back. Hayden and Babbitt were always suspects in the shooting, but investigators said not enough evidence had surfaced to meet the required level of probable cause necessary to arrest them. NCIS and the N.C. State Bureau of Investigation looked into the case several times over the years. Miller's homicide was one of the first cold cases the NCIS Cold Case Unit began to investigate when it was formed in the mid-1990s, said NCIS Special Agent Wayne Mixon. Hayden accompanied Babbitt to Miller's funeral at Arlington National Cemetery, Miller's sister, Sharron Aguilar, told The Daily News last month. "We thought he was a friend of theirs, but then someone noticed a tattoo on George's arm that said ‘Vickie,'" Aguilar said. When Hayden was booked at the Onslow County Jail, no tattoo as described by several members of the Miller family was recorded. Four months after Miller's death, Hayden and Babbitt were married in January 1973, according to the Onslow County Register of Deeds. They were later divorced. Hayden retired from the Marine Corps in 1989 and went to work in local law enforcement. He spent time with the Carteret County Sheriff's Department and served as chief for Cape Carteret and Belhaven police departments. He was fired from Belhaven in March after the town manager said he was insubordinate. Hayden's son, Joshua Hayden, a Cape Carteret police officer, told WNCT-TV he is struggling to believe his father is capable of what he is accused. "My father is a good man, very law abiding, a strict law abider," he said. "I don't see him committing a murder now or 36 years ago." Miller and Babbitt's daughter - who was 1 year old when Miller died - told The Daily News on Wednesday that she was still in shock over her mother and former step-father's arrest in her father's death. "I am caught in the middle," she said, explaining that while she believes her mother helped kill her father "she is still my mother." Wendy Miller-McGee said Hayden and Babbitt split up in 1977 or 1978, but Hayden and Babbitt shared children and they would all still visit and go on vacations together. She said Hayden was there for her when her daughter was born. Miller-McGee said she often asked her mother growing up about what happened to her father, and Babbitt would tell her she did not want to talk about it. Brown said since law enforcement spoke to the new witness, they have worked around the clock reviewing the case file of about 3,000 pages and re-interviewing witnesses. Sheriff's detectives and NCIS special agents have made several trips out of North Carolina during the last several weeks. "One tidbit that was needed came to the Sheriff's Department after the couple of articles in the Jacksonville Daily News and when you get that, it brings not only life back to the case but it brings an inspiration to the investigators," Brown said. JACKSONVILLE, North Carolina – William Miller's final errand was supposed to be a good deed, helping his estranged wife with car trouble. The Marine sergeant left home one night in 1972 and within the hour was found dead on a rural road. Miller's ex-wife Vickie Babbitt, 58, is scheduled to go to trial in March 2010 on charges of first-degree murder and conspiracy to commit murder. Also charged with murder and conspiracy are George Hayden, 57, who married Babbitt after Miller's death and later became a small-town police chief, and Rodger Gill, 56, an ex-Marine who was friends with the others. "All these years I've been carrying on this crusade trying to get the cold case reopened. Everything fell into place. I just know we have divine help," said Miller's sister, Sharron Aguilar, 68, who with her husband owns an automotive air conditioning and restoration company in Houston, Texas. Lawyers for the three people charged either declined to comment or did not return calls. Trial dates for Hayden and Gill have not been set yet. All three are free on bond. Miller, Hayden and Gill were all friends in the Marines Corps. On September 16, 1972, court records say Miller got a call from his wife asking for help with car trouble. A month earlier, he had kicked her out of their Jacksonville house after returning from a year's service in Okinawa, Japan, to find George Hayden living with her. He beat up Hayden to get him to leave. When his wife of two years walked out with Hayden, they took the Millers' 1-year-old daughter, Wendy. "I spoke with him for the last time when he called crying to say he found George living with Vickie. He stated George would not leave, so he beat the living hell out of George," Miller's sister Aguilar said in an e-mail to The Associated Press. "George then threatened Bill stating 'I have an M-16.' He told me he was getting a lawyer to divorce Vickie and fight for Wendy." Aguilar said she always suspected Babbitt. When her brother died, Babbitt called the family and told them he had been killed but didn't offer any details. She attended the funeral at Arlington National Cemetery with Hayden, but wouldn't talk with the family. Hayden's son, Joshua Hayden, a Cape Carteret police officer, told WNCT-TV last year that he didn't think his father is a criminal. "My father is a good man, very law abiding, a strict law abider," he said. "I don't see him committing a murder now or 36 years ago." He did not return calls from The Associated Press seeking comment. Aguilar never quit trying to get the case open. When Lindell Kay, a crime reporter for The Daily News of Jacksonville, started working on a project about unsolved murders, Aguilar sent him the initial investigation report and Kay wrote two stories about the case. After Kay's stories appeared in August 2008, a former baby sitter for Miller's daughter named Bonnie Sharpe came forward with key information. Sharpe was engaged at one time to Gill. Sharpe told investigators that Gill had witnessed the shooting, according to news reports. Sharpe did not return AP calls seeking comment. Sharpe's tip became the starting point for a new investigation and led to the arrests of Babbitt and Hayden one week before the 37th anniversary of the murder. Police charged Gill in January 2009 with first-degree murder and conspiracy to commit murder. He was arrested in Athens, Ill., a small town near Springfield. "I know we're going to get justice. I don't have any doubts because I know I had divine help with this," she said. "Every step of the way, a path opened. I don't think I was led this far to be disappointed." JACKSONVILLE, North Carolina — William Miller’s final errand was supposed to be a good deed, helping his estranged wife with car trouble. The Marine sergeant left home one night in 1972 and within the hour was found dead on a rural road. Thirty-seven years later, three people, including a man from Athens, face trial on murder charges for what prosecutors say was an ambush triggered by a love triangle around Miller’s wife and violence between Marine pals. Miller’s ex-wife, Vickie Babbitt, 58, is scheduled to go to trial in March on charges of first-degree murder and conspiracy to commit murder. Also charged with murder and conspiracy are George Hayden, 57, who married Babbitt after Miller’s death and later became a small-town police chief, and Rodger Gill, 56, an ex-Marine who was friends with the others. Gill was arrested in Athens, his hometown north of Springfield. A month earlier, he had kicked her out of their Jacksonville house after returning from a year’s service in Okinawa, Japan, to find George Hayden living with her. He beat up Hayden to get him to leave. When his wife of two years walked out with Hayden, they took the Millers’ 1-year-old daughter, Wendy. Prosecutors say Babbitt faked car trouble to lure Miller to a secluded stretch of rural road in Jacksonville. They say Hayden was waiting in a ditch with an M-16 rifle and shot Miller in the temple and back. Miller appears to have been surprised: When police found the car, its engine was running, the headlights were on and Miller’s pistol remained in the front seat, unfired. Aguilar said she always suspected Babbitt. When her brother died, Babbitt called the family and told them he had been killed but didn’t offer any details. She attended the funeral at Arlington National Cemetery with Hayden but wouldn’t talk with the family. Babbitt and Hayden married four months after Miller’s death, then divorced four years later. Hayden retired from the Marine Corps in 1989 and worked for the Carteret County Sheriff’s Department before becoming chief for the Cape Carteret and Belhaven police departments. Aguilar never quit trying to get the case open. When Lindell Kay, a crime reporter for The Daily News of Jacksonville, started working on a project about unsolved murders, Aguilar sent him the initial investigation report, and Kay wrote two stories about the case. After Kay’s stories appeared in August 2008, Bonnie Sharpe, a former baby sitter for Miller’s daughter, came forward with key information. Sharpe was engaged at one time to Gill. Sharpe told investigators that Gill had witnessed the shooting, according to news reports. Sharpe’s tip became the starting point for a new investigation and led to the arrests of Babbitt and Hayden one week before the 37th anniversary of the murder. Police charged Gill in January 2009 with first-degree murder and conspiracy to commit murder. He was arrested in Athens. Aguilar said she plans to be at Babbitt’s trial in March.